SCHOOL ORGANIZATIONAL CRAFTS FOR KIDS : Learn how to organize your school papers and homework papers, pencils, pens, erasers, paperclips and other school supplies with the following organizers. It is so difficult to get any work done when you're workspace is messy and cluttered. I am mostly a messy person, but when it comes down to have to work or study, I can't get my mind to concentrate if I am in a cluttered area. So for that reason, I made this section on the site for school and work desk organizational crafts. These crafts will help you organize and de-clutter your work space. You can make things like cubbies for your paperwork and office supplies as well as places to put your pencils and pens. Find more creative ideas below. If you are looking for a way to organize all the school papers that come home from school than this is a very easy craft to make to help you organize everything all up. Save and wash out milk cartons for as long as it takes to save up enough to make a good sectional cubby system. Then glue them all together, side to side, and top to bottom for enough rows and columns. After you are done....measure up the front end of this cubby system. Then cut out a piece of cardboard for the lid. Hinge it at the top with a piece of duct tape. Then cover the unit with nice decorative paper or wrapping paper. You can make a yarn or ribbon loop and a button at the bottom to latch it down. Label all the cubbies to find things easily. 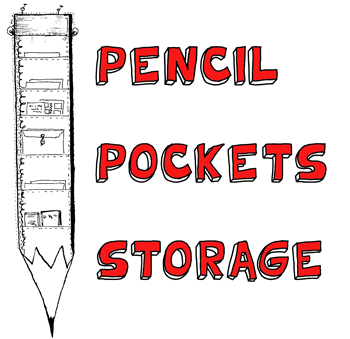 This is a great school organizer...plus it looks like a school pencil. Paint a large piece of paper to look like a pencil. Then go out and get contact paper and cover it completely. Then get large, clear plastic bags and attach them like pockets all over the pencil...either by sewing or by gluing on the 3 sides, keeping the top open so it is like a pocket. Then hang it on the wall. You can attach a whiteboard marker with a string to the top of the pencil so you can write messages and notes all over the pencil for reminders...store schoolwork in the pockets. 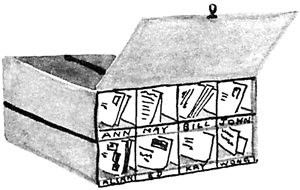 This is a great craft to make an alphabetical file for notes, clippings, stamps, labels, pictures, etc., are also at your fingertips in this revolving file. Seal about a half dozen old envelopes, then stand them on end and slit open the top of each one. Label each envelope. Punch two holes 5" apart on the side of each envelope. Punch corresponding holes in a slightly larger rectangle of heavy cardboard. Insert two metal rings from a discarded looseleaf binder and slide the cardboard between books on your desk or bookshelf for handy reference. Clever ways to Organize Craft Items to Get Rid of the Mess - Are you like me where you love the crafts, but hate the mess that storing crafts can make? It can be ridiculously hard to store crafts without creating a mess in the process. And, you know how hard it can be to find what you need for your crafts when you can’t find anything!! Well, today I’m going to show you how you can clean up your mess and organize your crafts in super cute and clever ways. Make an Organizational Homework Caddy - This Caddy is great because your child can take it wherever he / she wants to do their homework. How to Make a School Supply Box Craft Idea for Kids - Get your kids excited about going back to school with this cute and functional organizer. From crayons to calculators, this sturdy box will keep supplies handy for your busy youngsters. This is an affordable craft so it can be totally customized each year according to their current interests and ever-changing style. Making Suitcase Mailbox to Hold Papers & Letters - Today we will show you how to make a cool Valentine’s day Mailbox Suitcase to hold your classmate’s Valentines Day Cards. There is a slot to place your friend’s cards…and when you want to retrieve your cards, all you have to do is unbutton the suitcase straps and get them out. You can then use this suitcase as a treasure chest or storage container. Castle Pencil Holders - Make these castle pencil and pen holders with the top of a cardboard box as well as recycled cardboard tubes (paper towel rolls or toilet paper rolls). Plastic Bottle Organizers - Learn how to make these plastic bottle organizers with fabric, ribbon, and recycled plastic bottles. SchoolWork and Homework Organization Organizer Craft - Declutter your kitchen by creating this homework and school paperwork organization system for or with all of your kids. Make Fish Pen and Pencil Holder for Your Desk - Show people that you are the Big Fis by making this fish pencil holder for your desk. Organize all of those pens and pencils on your messy desk. Whale to Organize Loose Notes - Those loose notes getting you down? Make this spindle whale to hold all your lose notes and keep them together. Decoupaged Cereal Box School Papers Organizers - This is so easy to make. Just cut up a cereal box and glue on different cut out pictures...this one used Nintendo characters such as Donkey Kong, Mario, Luigi, Link, etc. Shark Pencil Pouches - Find out how to make these shark pencil holders out of denim and vinyl ... however you can use other fabrics if you want to (this is a sewing craft). Teddy Bear Pencil Cases - Find out how to make these zippered, fabric pencil pouches. Make Bulletin Boards to Organize Family Events - It is so hard to get everything organized and de-cluttered when you have kids. If you have a lot of dates, appointments, grocery list items, messages, and other important facts straight, then why not make a family oriented family board. Making this family bulletin board can help you and your kids more organized and help you remember dates and other important information and appointments. Simple Cardboard Desk Organizer - This is soooo simple to make but turns out so nice. These organizers are just made from recycled cardboard. Tin Can Bookends - These bookends are made out of plywood and flattened tin cans. This is a craft hat requires parental supervision. Make Sewing Box or Organizational Box with Step by Step Instructions - Although this craft was intended for a sewing box, it would make an excellent organizational box for your school supplies. Neck Tie Pencil Holders - Learn how to make these cute pencil holders with a neck tie. Milk Container Organizational Shelf - Put little gizmos and doodads in these organizational shelves. CD / DVD Case Pencil Box - Learn how to make a pencil box out of a CD / DVD case. Make a Fancy Pen Holder - If you want to make a pen holder for your desk than this is a great craft...it is quite elegant. Desk Trashcan - Use an oatmeal box to make a beautiful waste basket for your desk..stay organized. Back 2 School: Make Your Own Locker Organizer - Ready for the best year ever? Going to a completely new school? You'll be busy with homework, making new friends, and joining activities. So staying organized will be quite the task! Here's a cool design project to help! You can make these organizers to help you keep it together, and it uses recycled materials - so it's helping the environment, too! Back-to-School Organizer Idea for Students - It’s the return of morning-hustle-out-the-door, scheduling, and paperwork chaos. No problem: Find easy organizing ideas by clicking on the orange dots. Build a Back to School Bulletin Board Craft for Kids - Congratulations! It’s back to school for your fourth grader, and you both are in for a great year. You can expect new reading books, new math work, and exciting new studies in science and social studies. And of course, some more growing up along the way! But schoolwork can get disorganized pretty quickly, too, when a kid this age is handling so many different subjects. Carryall Castle Arts & Crafts Activity for Kids The towers of this desktop fortress are just right for stashing a host of school supplies. Craft Supply Organizer - Made from a hanging shoe holder, with a craft item stored in each pocket, our space-frugal organizer lets little crafters find (and return!) what they're looking for--whether it's buttons, bottle caps or beads. A sample item is affixed to the pocket for easy visibility. Crafter's Carousel Crafts Idea for Organization - This versatile rack and carrying tray can be adapted to hold drawing tools (as we show here) or other collections of craft materials (see "Customized Craft Kits" below). Set the tray on a lazy Susan and it lets all the kids at the table have access to the pens, pencils, markers, rulers and glue sticks. Each removable tub is color-coded, encouraging its eventual return. Crafty Solutions : Recycle Household Items for Organizing your Kids' Art Supplies - There's nothing like an art or craft project to promote creativity, dexterity, and confidence in a child -- and leave you with a bit of a mess. You'll find a few homespun solutions that will help your young artist in residence stay organized and inspired: an easy-to-make drying stand for her latest paintings, a Magnetic Tote for art supplies, plus pointers below that make it a cinch to keep stock of everything from paper and glue to beads and pom-poms. Crayon Caddy Box Craft : Box Crafts Actvities for Children With the crayon caddy box craft, keeping track of your kids' crayons has never been easier. The opening of a sandwich bag box is just the right size for little hands. Crayon School Box : Crafts with Oatmeal Containers for Kids – This is something you don’t get to see everyday. This art craft organizer/container will make tidying up your children’s things not a chore but a fun activity instead. You also get to choose your favorite color in designing this kid’s craft item. Craft Foam Wall Pocket : Crafts Foam Crafts Ideas for Kids - This simple project serves two purposes: It’s decorative and controls the clutter! Create a Homework Magnet Board Arts and Crafts Project - This magnet board is a great way to create a “strategic plan” for your child’s after school hours, all the way up 'til bedtime. Create a Homework Space Kids Organizer Craft - Create a more functional homework space where the kids can study without so many distractions. Desk Organizer Craft for Kids to Make for Back to School- Make these desk organizer containers to bring to school or for your homework area such as your desk. DIY Milk Carton Organizer Craft for Kids - Here's an easy tutorial for creating your own containers out of milk cartons. It's probably obvious, but I'll give you a quick walk through, just in case. Fairytale Castle Crafts Ideas for Kids Who could resist trying this gorgeous fairytale castle craft! Easy to make from cardboard tubes and others scraps, it makes a fantastic desk tidy which will make any child happy to sit down and do their homework. Felt Organizer Sewing Craft - This Felt Organizer is so versatile that you can use it to store pencils, markers, paintbrushes or use it as a sewing case. However you use it, it is an easy beginner sewing project. Flashback: Turn Soda Bottles into a Desk Organizer - Make a really coold desk organizer with the bottom of soda bottles. Funky Pen Holder This pen holder can also be made smaller and used for holding pins or paper clips on your desk. Kids' Room Container Crafts : Oatmeal Container Crafts Ideas for Kids - Even ordinary items, such as rubber bands and spools, look great when they're turned into patterned labels for desktop containers. Home Information Center : Back to School Organizer - Today's busy families have hectic schedules. To keep track of who's doing what, you need an organizing system that's a bit more sophisticated than the refrigerator door and a bunch of magnets. How to Make a Homemade Pack Organizer for a School Desk - Also called Desk Back Sacks and Chair Pockets, these handy little organizers can be made fairly easily and with little expense. Best of all, they can be customized to the exact dimensions of your chairs and be designed to hold the specific supplies you'd like your students to store. Think carefully about what materials you'd like the pack organizers to hold, then construct the exact product you want using these directions. "Leather" Desk Organizer Back to School Craft - We used an old "leather-like" purse that was purchased at a garage sale to make this desk organizer. Letters and Things Organizer - Tuck stamps, scissors, a pen, and address labels in one section; sort mail into "outgoing" and "incoming" sections to keep things organized. Locker Organizer Crafts Activity for Kids - This Locker Organizer craft is a fun and fashionable way for kids to customize and organize their locker. Make a Homework Caddy Kit Back to School Craft - Parents, you’ve probably noticed by now: it’s a rare kid these days who will always study at a desk. Here is a creative and practical “traveling desk.” that you and your child can make as an arts and crafts activitiy and bonding experience. Make a Homework / School Papers File Caddy - Want to bring some much needed organization into your middle schooler’s life this year—and into your family relationships while you’re at it? Start off right by establishing systems of organization that will help your kid get on top of that homework schedule and all those important papers. Here is a filing project to get your kid started. Message Mobile Arts and Crafts Organization Activity - Hung from a plant hook or the bottom of a kitchen cabinet, this message center will keep important notes, permission slips, and school announcements from getting trampled, stained, eaten by the dog, or just plain lost. 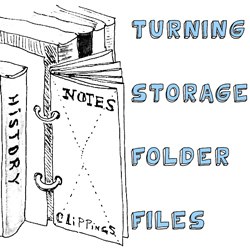 Overcome Organization Frustration With a Better Binder - No matter how daunting the task of organizing, knowing where to find the kids' art work and school records, that priceless family recipe for key lime pie or the presentation from last year's stockholder meeting is important. Now there's one simple way to get organized and stay organized - in any situation. Paper Organizer Craft for Schools - This easy-to-make honeycomb-shaped wall shelf is great for holding tiny trinkets. Just add more tubes to show off a larger collection. Painted Glass Vase Arts & Crafts Desk Organizer - Recycle a jar into a pretty gift vase or pencil pot that will add some color and organization to your homework desk. Pencil Pot - Put a lid on desktop clutter with this handy holder for school supplies. Personalized Pencil : Making Case Holders Crafts Activities for Children Case Make this super easy and adorable pencil pouch as you head back to school! Placemat Organizer Crafts for Kids - Simple and quick stationary organizer made with one placemat. Keep all your writing materials in one convenient place. Great to use when traveling. Pup for Pencil Holder - The next time You need a pencil at your desk, this dog will fetch it for you. Ribbon Bulletin Board School Organization Craft - Post photos, memos, and general messages on this easy-to-make home data base. Ribbon and Lace Message Organizer - Use leftover ribbon and lace, or buy end-of-roll trims on sale to make this economical ribbon and lace message center. Slide phone messages, appointment cards or personal love notes under the ribbons to keep family members organized and "on the same page." Space Saver: Create a Notebook Holder Craft Activity for Kids - Here's an easy project that has your child organizing her space by upcycling empty cereal boxes to create a handy, one-of-a-kind notebook holder. Tree Bark Pencil Holder Craft for Pencil Organization - This is a surprisingly simple craft that looks great when complete! It's meant to look like an Rainbow Eucalyptus tree, though I think we didn't use quite enough green on ours. Either way, it's very pretty. Wolf Desktop Organizer – Teach your kids the value of being organized with their things by helping them make this one of a kind desktop organizer. Woven Desk Caddy Craft for Kids - This project can be made for Mom's home office or her desk at work. Don't forget to make a matching one for yourself! 10 Organizing Tips for Back to School - If you thought the year was just a little too hectic, I've put together some great organizing tips to prepare you for the year to come. These are easy to follow practical tips to start NOW! Don't wait until September - planning is the key to a smooth, stress free school year. 10 Back-to-School Organizing Ideas - Going back to school is both exciting and scary for many students. For parents, it means buying school supplies, registering your child and updating immunizations. Being organized at such an important time of the year makes the whole process much less stressful. Here are 10 back-to-school organizing ideas that you can do to start the year off as smoothly as possible. Back to School Crafts to Get Kids Organized! - Now that school is back in full swing, the careful steps you took to keep your child organized may have begun to unravel. No worries, it's never too late to get the organization system back on track. Here are three fun autumn crafts that will help your child keep his desk neat, his closet clean, and maybe even get him to school on time! Corner Homework Organizers Make Study Time Efficient - One great way to help kids get organized, without detracting from your décor or going over your budget, is purchasing a great corner unit for your child’s room. There are many affordable options available, or you might even decide to build your own. How to make a Denim Organizer - If you would like to make an organizer that is sturdy and affordable, the easiest way I know of is to use a pair of old jeans. You can make different sizes for different uses. Organizing for Back to School - Well it's that time of the year again when the lazy days of summer can quickly turn into an overwhelmed chaotic nightmare if we aren't prepared for back to school. And by prepared I mean organized. Incorporating some simple organized solutions into your day can take you from stressed out to calm and controlled when it comes to getting the kids out the door and off to school each day. Organizing School Papers - Schools out, schools out…teacher let the monkey’s out! Now what!?!? I know there are some of you out there that have been collecting school papers and artwork all year long and your bin or bag is overflowing from this past school year.